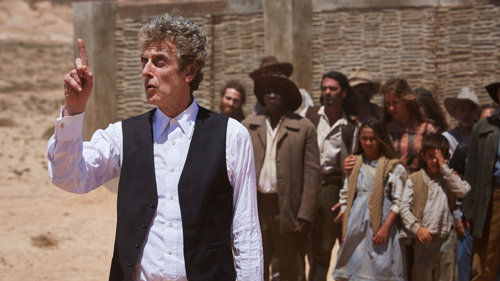 If last week's Doctor Who was Steven Moffat at his cleverest, finale "Hell Bent" saw him at his most exasperating. It exhibited a common problem: an abundance of intriguing ideas and scenes, incoherently told. The opening stretch of the episode was the best—with The Doctor (Peter Capaldi) back on Gallifrey, now a war hero with enough public support and military respect to overthrow Lord President Rassilon (Donald Sumpter) and use Time Lords technology to save Clara (Jenna Coleman) seconds before her death. Using time-travel for such a thing is a big no-no, of course, because altering a 'fixed event' like someone's death risks destroying the universe, but of course The Doctor had a plan to prevent that nasty repercussion... right? Well, I guess so—but I gave up trying to decipher exactly what it was about halfway through this episode, and concentrated instead on all the cool visuals and the touching performances of Coleman and Capaldi (even if they could only do so much to salvage this finale). Admittedly, "Hell Bent" was worth watching just for the sublime moment when Clara realised The Doctor's spent an unreasonable 4.5 billion years trying to bring her back from the dead, as he tells her through teary eyes, he had "a duty of care". Wonderful. Anyway, it seems The Doctor thought stealing another TARDIS and running away, again, only this time with Clara to the end of Time & Space, would allow her timeline to 'restart' itself (symbolised by her own halted pulse resuming). That's all just gobbledegook of the highest order, of course. Why would her pulse stop just because she's been plucked from her timeline? I wouldn't have minded a head-scratcher like that, but then we had to suffer more doublespeak about the uninteresting 'Hybrid prophecy'—which The Doctor pretended to know the answer to, just to keep himself in high regard with the Time Lords. Most people's theory had the Hybrid's identity pegged as Ashildr/Me (Maisie Williams), whose half-alien genetics resulted in her immortality—but why exactly would she want to conquer Gallifrey as prophesied? Then, Ashildr herself suggested the hybrid is actually The Doctor (making the unpopular notion he's half-human from the 1996 TV movie canonical? ), but that didn't seem to go anywhere. Finally, it was suggested the hybrid is actually two people: The Doctor and his companion. 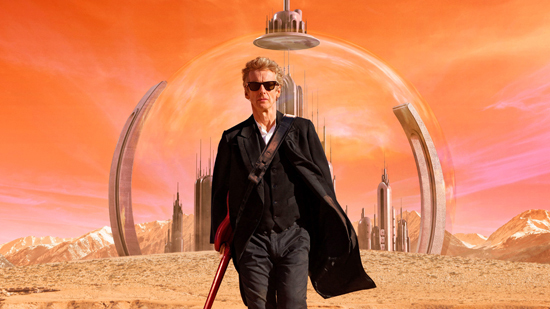 But again, why would they want to conquer Gallifrey? Oh, who knows. I don't think Moffat categorically settled on anything here. By the end of the episode, with typically sketchy reasoning, The Doctor and Clara had a 50/50 chance of getting their memories erased by a gizmo—which The Doctor believes is the only way Clara can escape her fate (not sure why amnesia would help anything, frankly). In a fun twist, it's The Doctor's memories of Clara that are removed—meaning the episode's spine of him recounting this adventure to Clara, now a waitress in an American diner (the natural career path for a teacher! ), took on a different perspective. The Doctor was actually oblivious to the fact he's talking to the actual "Clara" of his own half-remembered story, and only realised the truth when Clara and Ashildr vanished in his stolen TARDIS and left The Doctor's own TARDIS behind for him to continue his adventures. In another odd moment, it seems Clara is resigned to the idea she'll have to eventually return to Trap Street and 'face the raven' once again, but in the meantime she can have adventures of her own with Ashildr as her immortal companion. Do those two even get along? What's in this arrangement for Ashildr? And if Clara dies on her adventures before she gets to return to Trap Street, does the entire universe implode as the Time Lords warned? Yeah, "Hell Bent" was a big, expensive-looking mess that didn't tie things up very neatly. It wasn't an unpleasant mess that angered me, but it was still more absurd than inspired. Still, it was great to see Gallifrey for substantial screen time, and I didn't mind how this episode undid the far better ending for Clara in "Fear the Raven" (mainly because I'm used to Who pulling unfair tricks like this one), but it was very hard to get a handle on what the bloody hell was going on! Doctor Who has a tendency to be like this under Steven Moffat's leadership, but this hour felt particularly slippery, unwieldy, and distancing. Nothing much clicked into place for me about Series 9's sorely misjudged Hybrid mystery (in fact, I'm even more confused by it), and The Doctor's plan never felt remotely logical to me. There was just enough individually good moments and poignancy to elevate my star-rating, but it was a close call. See you at Christmas, where the festive specials have a much lower success rate than the series finales! But hey, River Song's back and Greg Davies is her decapitated husband, so it'll be fun, yeah? Nice that The Doctor finally gets a sonic screwdriver, and it can actually be spat at him from the TARDIS console now. Those sonic sunglasses really didn't work, and I can only assume Moffat insisted on them becoming a staple of Series 9 so he could get an easy shiver of schoolboy excitement from a proper sonic screwdriver showing up at the end. 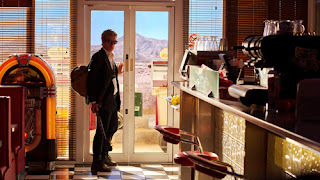 Funny how The Doctor played Murray Gold's composition for Clara's theme tune on his electric guitar. This seems to be a recurring meta joke that The Doctor can essentially play the show's soundtrack, royalty-free. There's no getting around it now, despite Missy's misleading comment earlier in the series that gender-swap regenerations require an expensive upgrade: a Time Lord can turn into a Time Lady. It happened right in front of our eyes. And there was even a cheeky line from actress T'nia Miller about her previous body being the only time she's been male. It seems a gender-swap regeneration is possible, but a rare occurrence. Hang on: The Doctor spent 4.5 billion years inside the confession dial? Sort of, but because it took millions of exact copies, The Doctor who finally escaped only has memories of toiling away inside the dial for around 7,000 years. Right? So, from the perspective of Gallifreyans it was nevertheless 4.5bn years? So, um, how come The General (Ken Bones) hasn't once regenerated since the Time War? He had a ridiculously good run in that form! 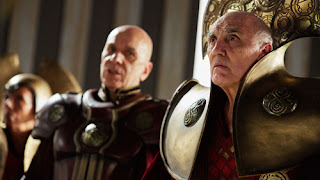 Guest star Donald Sumpter is a familiar genre face, having appeared on Being Human and Game of Thrones in recent times. He's currently appearing in Jekyll & Hyde, too. But did you know he's been in Doctor Who twice before, in "The Sea Devils" and "The Wheel in Space"? Speaking of Sumpter, I'm guessing his Rassilon will be back to antagonise The Doctor as another Time Lord nemesis along the same lines as Missy.